Collision? Interaction? Event? What’s that all about? Interaction? Collision? Event? Physicists use many words to describe what you are seeing here. Today’s column helps sort out those confusing terms. Those of you interested in the sorts of physics pursued by scientists working on the Fermilab Tevatron or CERN’s Large Hadron Collider may hear scientists casually toss around words that all seem to mean the same thing – interaction, collision, beam crossing or event. If you get confused when you hear a physicist talk about these things it’s because…well, I have to admit…we can use them in confusing and inconsistent ways. Usually an expert can pick up on what is meant by context, but it can easily set a non-expert’s mind a-spinning. Let’s start with the word interaction. Interaction means kind of what it sounds like: Two particles interact with each other or somehow affect one another. Sometimes the interaction will change the particle’s identity, as when a quark and antiquark come into contact, annihilate and turn into a Z boson, which then decays into an electron and positron. In another interaction, particles moving toward one another might change each other’s direction. More commonly, they rip each other apart. So an interaction occurs when two subatomic particles somehow “mess” with one another and change each other’s identity, trajectory or energy. A collision is an interaction in which the particles approach each other with some velocity. In a generic interaction, two particles could just be sitting at rest next to one another (although this essentially never happens in collider physics). In a collision, we need to somehow shoot one or both at the other. When scientists shot particle beams at one another at the Tevatron or when they do this at the Large Hadron Collider, it isn’t like two fire hoses aimed at one another – it isn’t a continuous stream of particles. Rather, the beam is separated into what we call bunches. They can be visualized as little sticks of spaghetti. Each stick is separated from others by some distance, and each stick contains on the order of a trillion particles. In order to have an interaction or collision, you need to have two bunches traveling in opposite directions and timed exactly to pass through a detector simultaneously. If they do, there is a chance a collision will occur. A beam crossing refers to the moment in which bunches of beams are simultaneously in the center of a detector. If the beams aren’t very concentrated, the most likely thing that happens in a beam crossing is nothing – the beams pass through one another with no particles interacting or colliding. 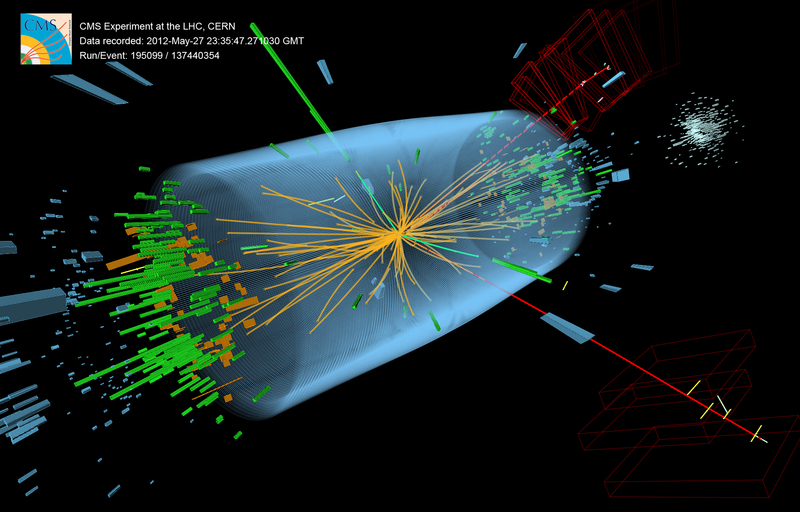 If they are concentrated, as at the LHC, for example, it isn’t uncommon to see 20 simultaneous collisions. Even in this case, most of them aren’t worth looking at, and the detector isn’t programmed to record them all. But once in a while, one of those collisions might be the signature of something interesting, so the detector records the passage of all particles made by collisions in that particular beam crossing. We call this an event. An event is made of at least one interesting collision or interaction and an indeterminate number of simultaneous uninteresting ones. Interaction: Two particles interact and somehow produce a change, be it in energy, trajectory or identity. Collision: Two particles are made to approach one another and actually undergo an interaction. Beam crossing: Two beam bunches pass through one another in the center of a detector. Event: During a beam crossing, one pair or multiple pairs of particles undergo a collision. In an event, often one collision dominates the signature in the detector. That’s it. Just don’t expect any physicist you speak with to be so precise with their language. We almost certainly will use terms interchangeably, and you have to winnow out the exact meaning by context. Or, I suppose, by reminding us to be careful.